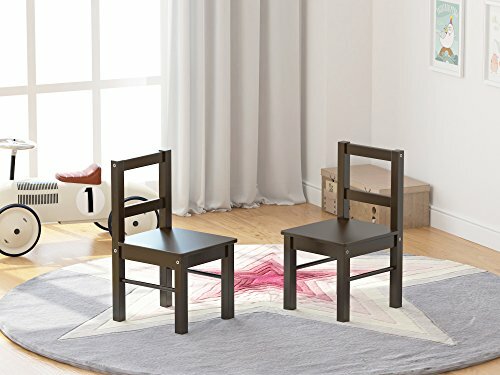 The UTEX Kid's Chairs (Set of 2) is the perfect addition to your toddler's room. The chair is constructed using wood that ensures years of efficient use.. It is designed with flat seat and traditional slatted back.. A versatile design, the chair can be used for additional seating space or as extras for a table. It offers seating space for two people. Recommended for kids 3 - 8. Compatible With "UTEX 2-in-1 Construction Table". Chair dimensions: 21"H x 11"W x 11.8"D. Kids Chairs Size fit most Kid's Table, gives your boys,girls the perfect place to write, draw or read on. Made from durable solid wood, features a flat square seat, and a traditional slatted back. A versatile design, the chair can be used for additional seating space or as extras for a table. Matches our Espresso table (ASIN: B01MQGKX41, B079BRB5BK and B0791BWHZH; sold separately) for additional seating. Specifically designed for younger children, recommended for boys,girls,toddlers ages 3 - 8. Ideal for kids bedroom or playroom, playschools, nursery etc due to its durability and safety standards.